Is JPMorgan Chase Stock a Buy in 2017? If interest rates continue to climb, profits at the nation's biggest bank by assets should follow suit, lifting its share price higher. Last year was a year to remember for bank stocks, many of which surged by double-digits after the presidential election in November convinced investors that profits in the industry could soon improve. But while 2017 offers a new slate of risks and rewards, it could turn out to be yet another very good year for the nation's biggest bank by assets, JPMorgan Chase (NYSE:JPM). At the end of last year, the Federal Reserve raised the fed funds rate, the primary short-term interest rate benchmark in the United States, for only the second time since the financial crisis. "Information received since the Federal Open Market Committee met in November indicates that the labor market has continued to strengthen and that economic activity has been expanding at a moderate pace since mid-year," the Fed wrote in its press release announcing the move. Although the central bank only increased rates by 25 basis points, or a quarter of a percentage point, the move nevertheless confirms that the economy is still headed in the right direction, continuing its slow but steady recovery from the 2008 crisis. It's also significant because banks make more money when interest rates are higher. US Target Federal Funds Rate data by YCharts. In JPMorgan Chase's case, its latest interest rate sensitivity analysis shows that a 100 basis point increase in short- and long-term rates would translate into $2.8 billion in additional net interest income in the 12 months following the rate hike. And if rates were to climb by 200 basis points, or two percentage points, then JPMorgan Chase would stand to earn an added $4.5 billion worth of net interest income. Strictly speaking, that additional income counts as revenue, not earnings. But because higher interest rates don't require a bank to spend more money to hire new employees or open new branches, most of that revenue falls directly to the bottom line. The net result is that higher interest rates will almost necessarily translate into fatter profits for JPMorgan Chase. Of course, the 25 basis point increase in December was only a fraction of the 100 basis points that JPMorgan Chase needs to generate the full $2.8 billion in added annual net interest income alluded to in its interest rate sensitivity analysis. But there are reasons to be optimistic on this score. In the first place, long-term rates shot up faster than short-term rates in the final months of last year. 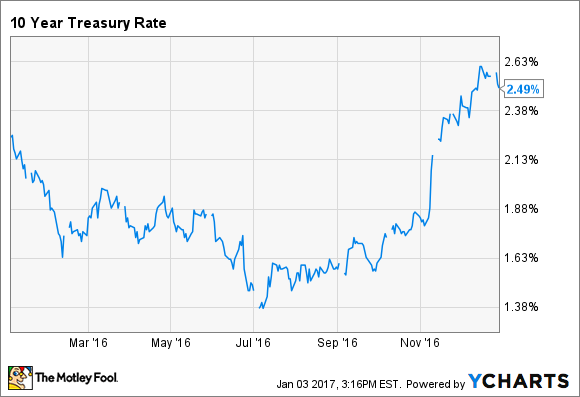 Between the end of September and the beginning of 2017, the yield on 10-year Treasury bonds, the primary long-term interest rate benchmark in the United States, climbed from 1.6% to 2.5%. That equates to 90 basis points. 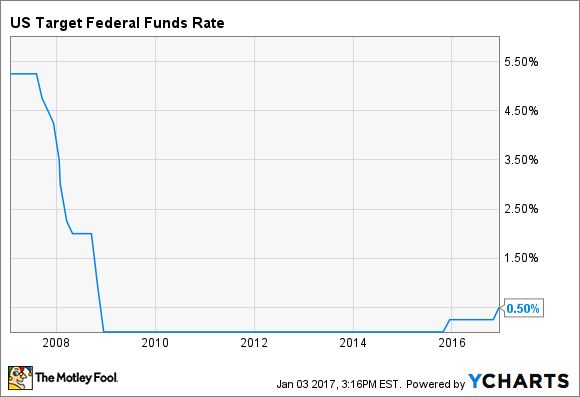 And there's reason to believe that short-term rates will follow suit in 2017, as the majority of the members of the Fed's monetary policy committee are targeting a fed funds rate of between 1.25% and 1.5% or higher by the end of this year. This calls for at least three rate hikes of 25 basis points in 2017, bringing the total increase in short-term rates to 100 basis points after factoring in the Fed's move in December. This doesn't necessarily mean that JPMorgan Chase's stock is a screaming bargain. After all, it did climb 31% last year. However, even though it's much more expensive now than it was six months ago, it's still not excessively overvalued, trading at a 30% premium to its book value compared to the two or more times book value that's generally associated with overvalued bank stocks.